Show that you believe in a cure with our Believe Silicone Awareness Wristbands. Proudly wear your bracelet so everyone knows you support your Awareness. Each Purple Bracelet arrives with the saying: Believe in white. A perfect addition to any team walking in an Awareness event. Purple is great for spreading awareness of Pancreatic Cancer, Alzheimer’s Disease, Crohn’s Disease, Cystic Fibrosis, Epilepsy, Lupus, Fibromyalgia, Testicular Cancer and Thyroid Cancer to name a few. I wear them always. Great way to send out some awareness! Additional Info We offer many Personalized Purple Awareness Apparel and Gifts so that you may show your support each day. Give our Gifts to a loved one or use our Awareness Keepsakes for any Special Charity Events or Awareness Walks you are involved in. 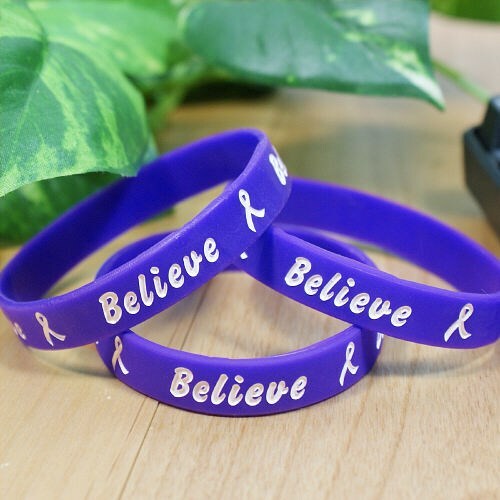 For more Purple Awareness Gifts from MyWalkGear.com, view our collection of Pancreatic Awareness Gifts, Alzheimer's Awareness Gifts, Epilepsy Awareness Gifts, Lupus Awareness Gifts & our Relay Event Apparel and Keepsakes.